Milk chocolate-covered toffee bits are topped with a rich pumpkin filling in a flaky pastry crust. Beat pumpkin, granulated sugar, brown sugar, cinnamon, ginger, nutmeg and vanilla with electric mixer on medium speed until well blended. Beat in eggs, milk and cream until well blended. Sprinkle toffee-flavored bits evenly onto bottom of pastry shell. Top with pumpkin mixture. Bake 1 hour, or until knife inserted in center comes out clean. Cool completely on wire rack. To serve, top each slice with whipped cream, if desired. 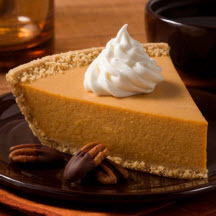 Nutritional Information Per Serving (1/8 of recipe without topping): Calories 417; Fat 20g; Cholesterol 97; Protein 6g; Saturated Fat 8g; Trans Fat 0g; Sodium 366mg; Carbohydrates 54g; Sugar 44g; Iron 0%; Fiber 0%; Calcium 0%.